As the name says, this technique was created by Backlinko’s Brian Dean. Basically, this technique is a system for turning your content into a high-quality backlink. 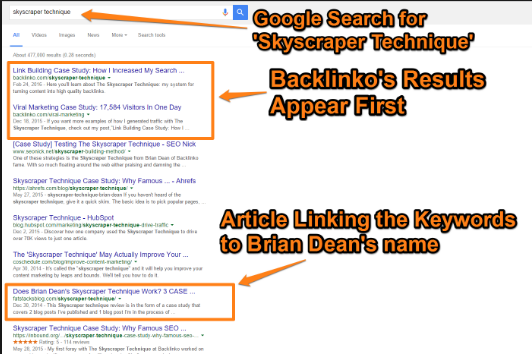 If you perform a search for Skyscraper Technique on Google, you would find many link building results, but you’ll see that Backlinko’s results appear first! Analyzing is the first step of the skyscraper technique – you need to get popular trends, topics, and engaging content that is already published by your competitors. Then, you analyze that content in a unique way and create a new article with the latest content and better design. Now, you can contact those folks with your improved content and explain to them what your content has that theirs doesn’t. By doing this, the possibility of getting a link to your site published on their own are very high. Your chances here are really good because you’ve curated something which already has high demand where the audience is related to your website. This means you get to the prime audience, and the page is already ranking on the top SERP. These are the top advantages once you get the link. If you’re not using Backlinko’s Skyscraper technique, give it a shot and see how easily you can get a high-quality backlink to your own website. I have been using HARO for a few months now for search engine optimization on my websites, and it has definitely helped me get closer to my goals. Basically, it involves sending an article of different topics related to trending technologies and reviews about different products to many reporters or journalists. Odds are, at least one of them will choose to publish the article and I get a link back to my website. Note: You need to register on HARO to make use of this technique. Once the basic set-up is done, you will start receiving a lot of emails, out of which you should figure out who is related to your niche or website. Now, select who you want for clients, contact them at regular intervals and keep an eye on their updates. If the topics you select impresses them, getting a backlink is easy as pie. Although this technique is not something many are aware of, it certainly does work. If you haven’t tried HARO already, then give it a shot now! Guest posting is one of the most-used link-building strategies. When I first heard about this and started an outreach program to get backlinks to my website, I was surprised by the results. From my experience, I suggest that you approach clients or website owners for the highest chances of getting backlinks. Basically, you get a backlink to your site when another website accepts and publishes your content. To start guest-posting, first analyze the site you are going to pitch to, write an article based on their audience, and send them your article. Depending on their incoming email queue, you can typically expect a response within 1-3 days. > Check your competitors’ backlinks by using ahrefs, semrush, and some other tools which you know. Pick the site where you don’t have backlinks and write to those websites for best results. > Here are a few guest posts I have submitted to websites like Dzone, YourStory, Simplilearn, and ShoutMeLoud. This is one of the most important strategies for link building. It’s every link builder’s dream to get their backlinks featured in a weekly link roundup. Link roundups are basically weekly or even daily arrangements of the best content from your industry. The best part of getting links in link roundups is that you get driven with a huge amount of referral traffic. Nice, right!? Who would say no to this? How to find link roundups? Just like you search for a website to guest-post on, there are a few search terms you can use to find link-roundups. Although different people call it different things, you can perform a search with the following words to find the latest roundups in your niche. Note: Make sure to use search tools in the Google search box to check that the round-ups are still running. Once you have found a link roundup related to your industry, connect with the publisher about your page and it’s advantages and show them why your content deserves to be featured in their list. This can result in a lot of visits to your link, so make sure your website is prepared to deal with high traffic. We now know that Google gives a lot of importance to link-building in a natural way. So make sure your links are relevant and link to authorized websites; produce high-quality content that is fresh and offers something new to your readers; and finally, constantly keep evaluating your content to see how things can be improved. 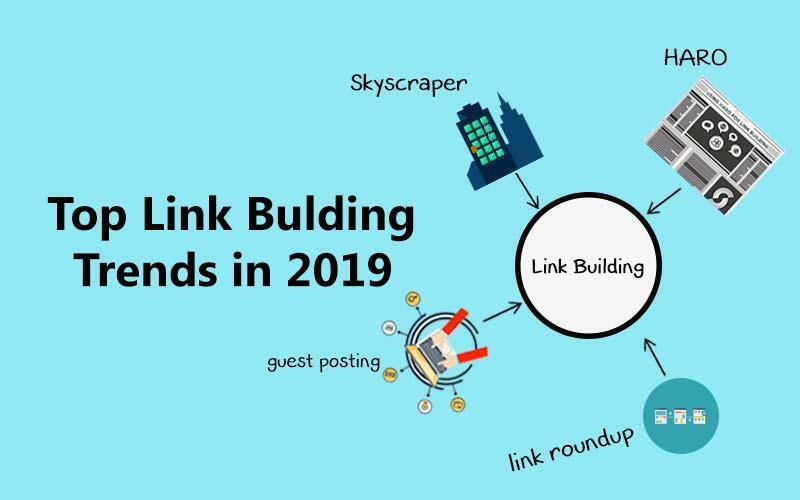 Check out the latest trends to follow in 2019 for link building and make your way to the top of the SERP. There are premium tools like Ahrefs, SEMRush, Mondovo and Moz Pro, that will help you reduce your effort and increase productivity. These tools are expensive but you can always find out deals and discounts for those tools and buy them at a lower price. I really hope you found this article useful and am sure that you’ll see an increase in traffic if these trends are applied to your websites. If you feel like I’ve missed something, have any suggestions or would simply like me to explain any other topic, please enter your comments in the section below.